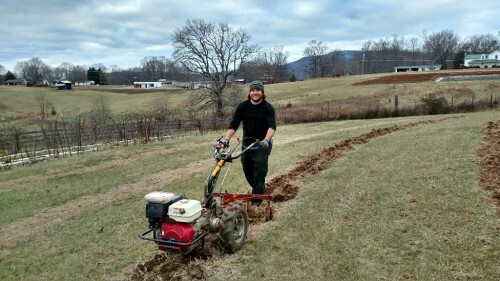 Plum Granny Farm Weekly Update -- So What *Do* Farmers Do in the Winter? Posted 1/12/2018 12:19pm by Cheryl. Hope you made it safely and warmly through the polar plunge earlier in the week! Our low was 3 on Sunday. Don't recall getting that cold before. We're not complaining though -- our sales rep at High Mowing Seeds was at -30 earlier in the week! But as our wacky NC winters do, we're up to 65 right now. 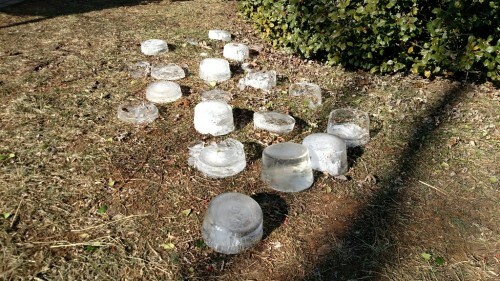 Our ice bucket sculptures in last week's newsletter are now completely gone. But we are looking to drop 40 degrees by tomorrow night down to 24. It's enough to make your head spin! So what DO farmers do in the winter? We get asked this question a lot. Many folks think that we nap a lot, read books for fun and watch a bunch of movies. Of course we did do some of that in December. And I'm reading Instagram posts (with some envy) about farmers taking vacations in Ecuador, Mexico and even just the beach. But now for us, as Ray says, "Break time is over!" We are flat-out in gear and preparing for the season ahead. And we've are planning a great one for you! The warmth this week has given us the opportunity to get some fields ready for spring planting. Although we don't want to shape beds yet, prepping the soil now will make it easier to get things in the ground come March. 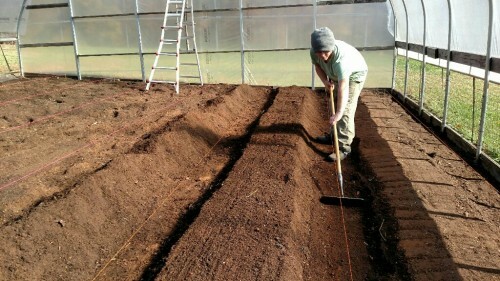 Jonny is learning how to use the Grillo walk-behind tractor and is using it here to prep the beds in Raz 1. There are 6 empty beds there now -- we removed fall-bearing raspberries a few years ago once the fruit flies (spotted wing drosophila) became such a problem for late fruit. 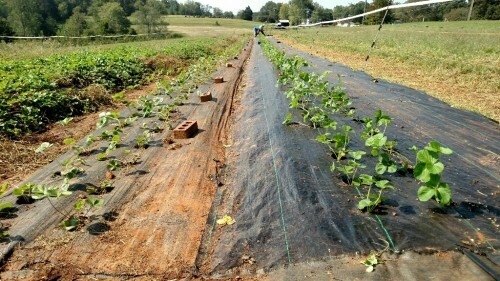 We'll be adding 2 more rows of blackberries and 2 rows of raspberries here along with trellised peas and beans. 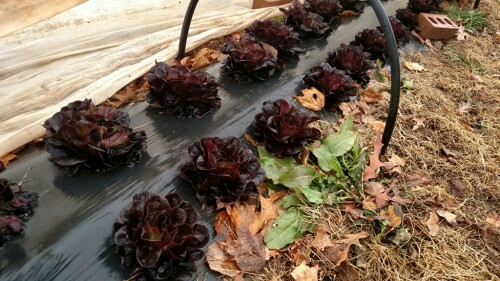 Plants are ordered and they'll get planted in late March! We are also doing lots of clean-up of the field margins to remove low hanging branches and to clear trees that have fallen. That generates a LOT of debris that we need to burn. We've had a couple of great days to do that -- no wind makes for perfect conditions. 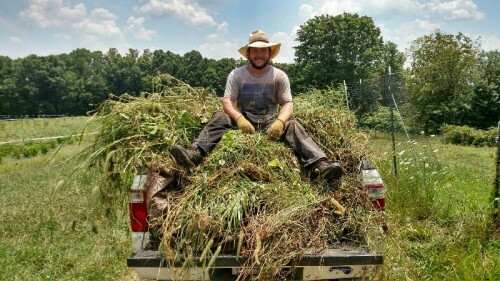 Here's Chris with what is left of several trailer loads of brush! 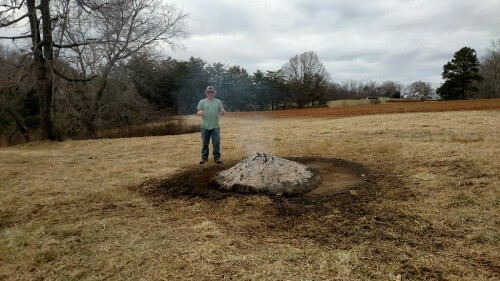 Since we have so many downed trees and brush to get rid of, we are researching making bio-char as a possible soil amendment. Stay tuned! 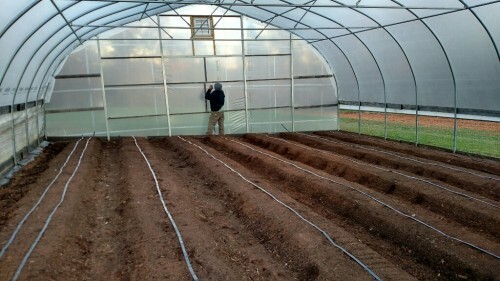 We are also tending our overwintered crops. Unfortunately several field crops didn't make it with the frigid temps. 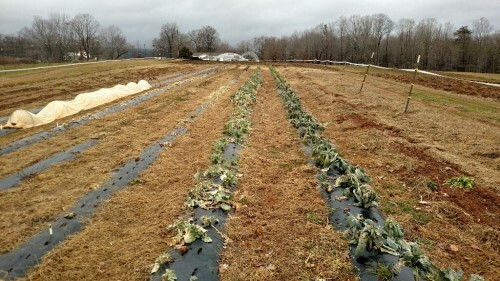 We hit the point of no return with our chard, kale, broccoli and even collards. 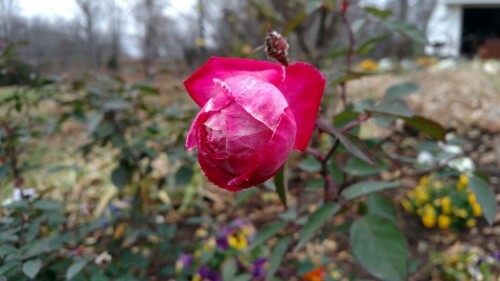 Most of these will take a pretty good freeze uncovered but it appears that 3 degrees is just too darn cold! But the good news is that plants in the hoophouse and even under cover in the field are doing pretty well! Farming in the winter is a bit like having your home remodeled on one of those HGTV shows -- waiting for the "reveal" can be a bit nerve-wracking! So see, farmers do a LOT in winter! We haven't even talked about putting together crop plans, ordering seed and planning events -- ALL of which we have been doing! So the next time you hear someone wondering aloud about "What DO farmers do in the winter?," you'll have an answer! That's about it for the news from the farm for now. We'd better get back to more crop planning and then over to the greenhouse to start seeding onions! Have a great weekend! Let's celebrate the life of Dr. Martin Luther King, Jr. on Monday and honor his memory by doing something to make a difference in the lives of our neighbors. It seems like we need something positive now more than ever. 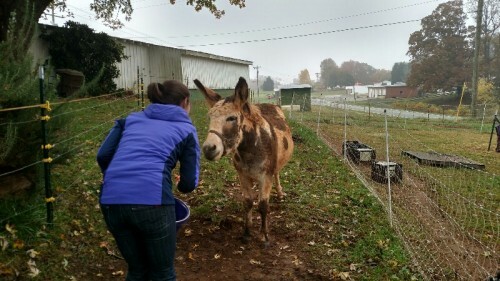 Plum Granny Farm Weekly Update -- All Aboard the Polar Express! Posted 1/5/2018 11:36am by Cheryl. 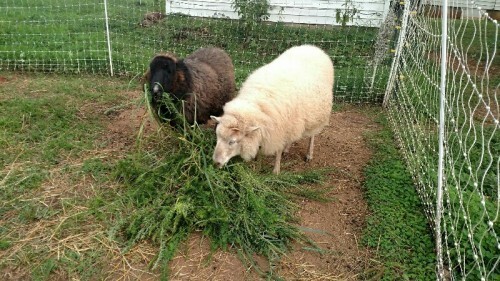 Hello Farm Friends! Happy Friday! Happy New Year! Boy, 2018 knows how to get our attention, huh? Call it the Bomb Cyclone or Deep Freeze of the Century, this stretch of cold weather is quite memorable. The lowest recording was 8 on Tuesday but the wind chill has been much, much colder. 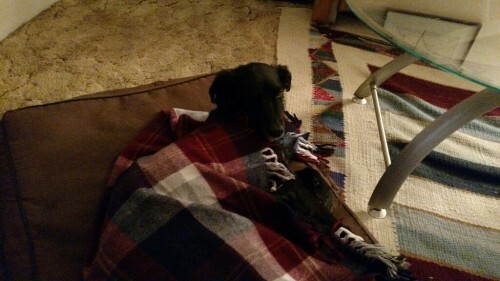 This weather even has Gesti enjoying a blanket! And as tempting as it might be to stick inside all day, every day during this wintry blast, we still have chores to tend to outside. We pile on as many clothes as possible (at times I feel like the kid brother in "A Christmas Story" -- I sure hope I don't fall down because I'm not sure if I'll get back up!). Having even a few animals requires us to venture out for their comfort and health -- I can only imagine what someone with a large herd does in conditions like this. Twice daily, we have to dump out the ice in the buckets and fill with fresh water. We are amassing quite a collection of ice sculptures, don't you think? 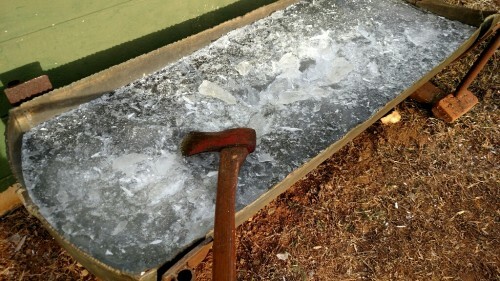 And the water trough has turned into a glacier -- even with daily chopping! 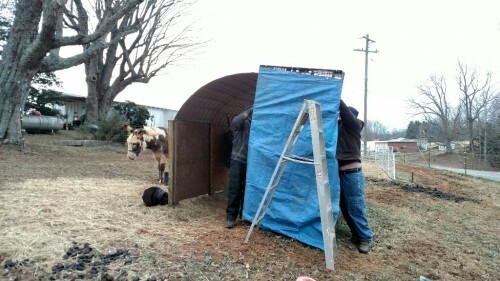 And we are trying to keep some of the wind off of Brix in her shelter. She's not quite as cold loving as BB and Tony. The pallets went up before the end of the year and on Wednesday Chris & Jonny covered them with a tarp -- which unfortunately ripped off in Thursday night's wind. Next try -- Ray installed a wood panel. If this blows down, we've got a LOT to be worried about! But despite the cold conditions, we try to keep a smile on our faces and count our blessings. That's easy to do when the sun comes out and the wind lays down. And stopping for a sausage biscuit snack during farm clean-up doesn't hurt either! 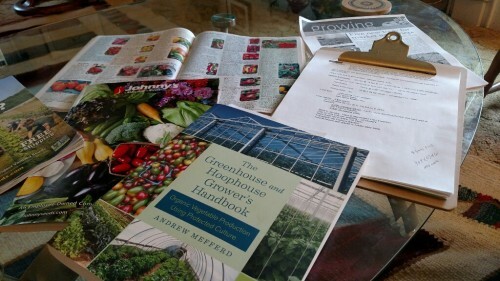 These cold days do make it easier to get our year-end wrap-ups done and to begin our crop planning for the new season. We have some wonderful things in store for you and we'll be sharing them soon! As we close this edition of the year's first newsletter, we want to share a photo collage with you. This is from our Top 9 posts in Instagram last year -- obviously carrots, garlic and ginger were a hit! 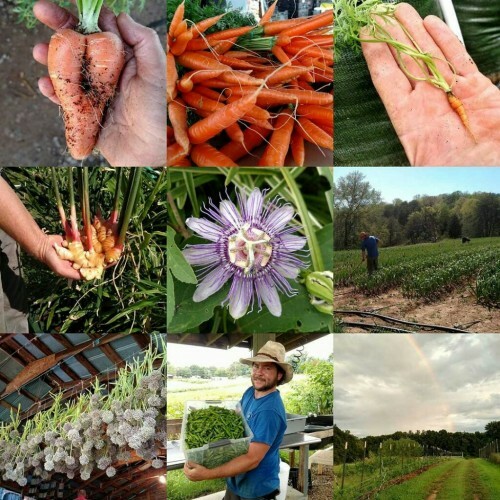 If you don't follow us on Instagram, please do -- we post several times each week about the goings on here at the farm. That's it for this week. Stay warm! Plum Granny Farm Weekly Update for December 22, 2017 -- Wishing You Peace, Joy, Love...and Garlic! Posted 12/23/2017 12:19pm by Cheryl. 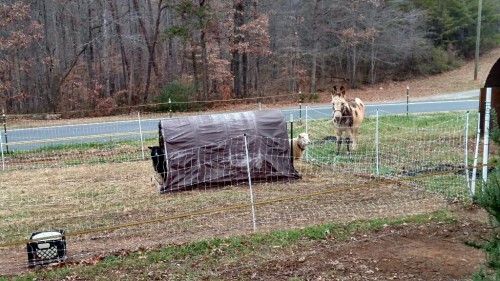 Hello Farm Friends! Happy Friday! Happy Winter! The shortest day of the year has passed. 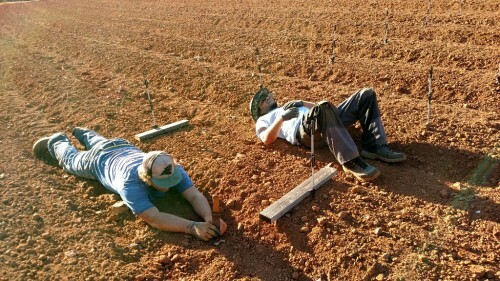 As farmers, we are particularly attuned to day length and light. It is always good to have the days get longer -- but as they lengthen by minutes, we'll be using this time of winter to plan for the long summer days ahead. And rejuvenate ourselves for the coming year. The Baler Barn project continues. The more we get into it, the more damage we've found. 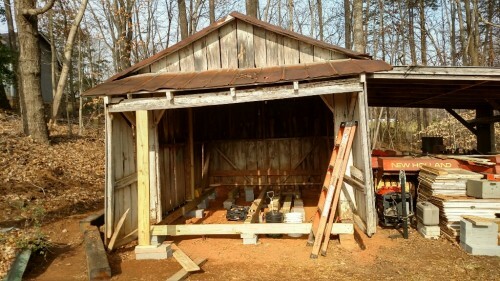 All of the beams had to be replaced and nearly all of the upright posts had to be repaired. And getting this 80-year-old building level and square is a challenge. But good progress is being made -- even though it's hard to see. But we have found some interesting graffiti! 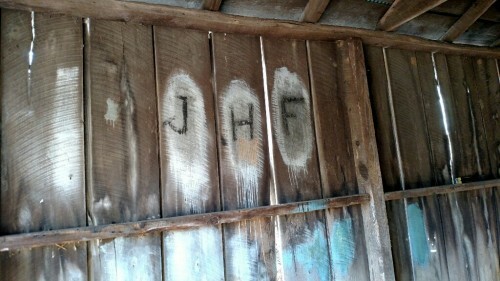 The JHF must be from Cheryl's dad, Johnnie Holt Ferguson! 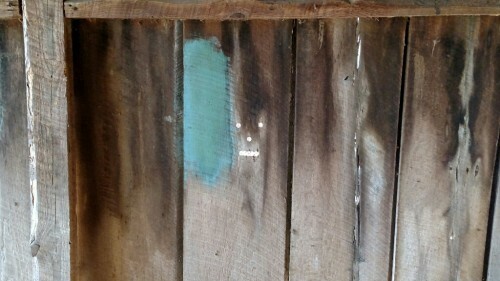 And the face is composed of drill holes. 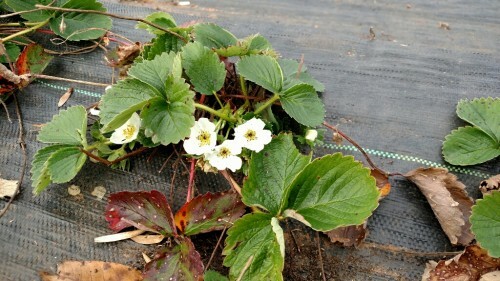 Other tasks this week included weeding and clearing the dead leaves from the strawberry plants. You can really see a huge difference in before and after! This is our last Weekly Update for the year -- we're taking a few days off to relax and enjoy the Holidays We so much appreciate you reading this newsletter and passing it along to your friends. 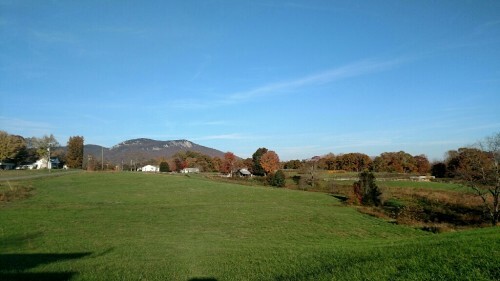 We are so thankful of your support of our farm and your interest in what we are doing. Your comments about these newsletters and our products really help us do what we do. We cherish your words of support and encouragement as well as your business! And most of all, we are most grateful for your friendship and trust. Here's wishing you the most wonderful Holiday Season ever! Joyous Solstice, Merry Christmas, Happy Kwanzaa and all good wishes for a Happy & Healthy New Year!! 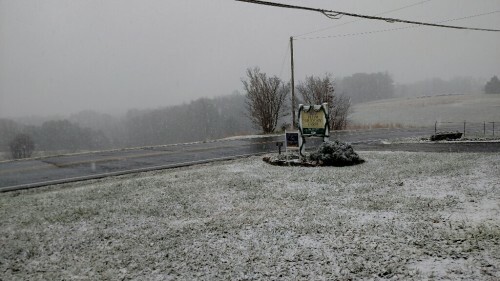 Plum Granny Farm Weekly Update for December 8, 2017 -- Let It Snow! Posted 12/8/2017 5:51pm by Cheryl. As I sit here writing this newsletter, swirls of snowflakes flutter down outside my window. It's Snowing!! The weather forecast has been a-l-l over the place so we're not sure if it is just a flurry or if we really are going to get some accumulation. But it is nice to watch the snow fall. Even if some things didn't get the memo. 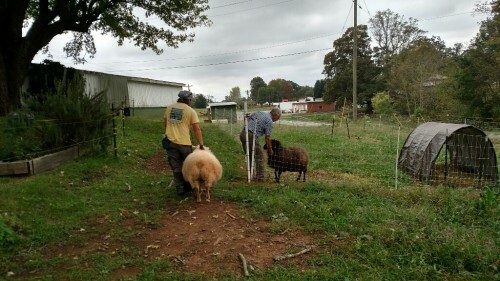 But Brix, BB and Tony definitely read the weather forecast and were making sure that we knew that they needed some hay to keep them well-fueled. It's done!!! Hooray! 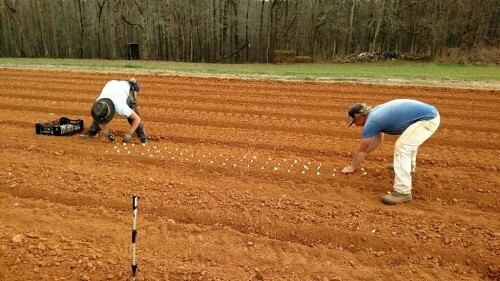 The garlic is planted! Oh, excuse me. Detroit wanted to make sure I mentioned that HE planted too! 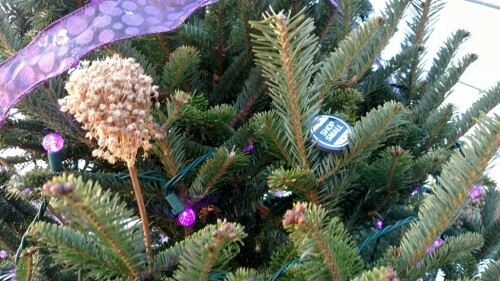 Now the field is adorned with dozens of tags marking the garlic varieties and sources and we await the emergence of the first plants. After knocking that task off our to-do list, we turned to get things prepped for the upcoming cold weather. The forecasts have bounced around like crazy but regardless, we knew that we needed to prepare for some pretty cold temps. 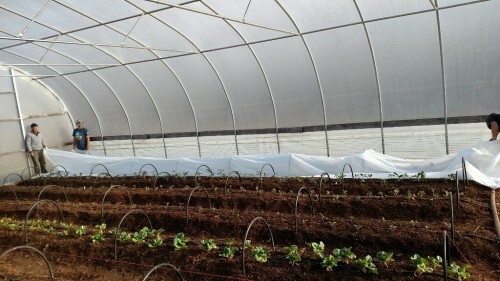 A key task was to make sure that we had row cover at the ready for the strawberries and in the hoophouse. Even though we won't have to actually cover things for a few days, it's good to be prepared so we aren't trying the find the right piece of fabric while the wind is whipping and the thermometer is heading into the teens (been there, no fun). So now we have things staged for the Polar Express -- whether or not it decides to come into town. 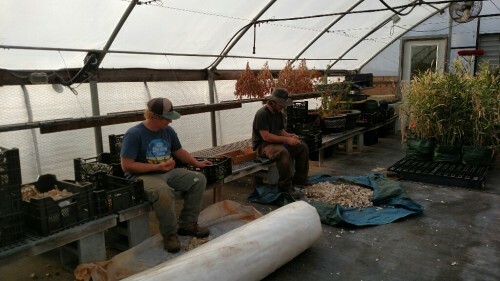 With the garlic planted, we've been cracking the remaining garlic for powder and granules -- the aroma of dehydrating garlic wafts across the farm for days! We'll be well-stocked! With markets behind us and garlic in the ground, we can start to breathe a bit (but not totally until our Organic Inspection happens!). 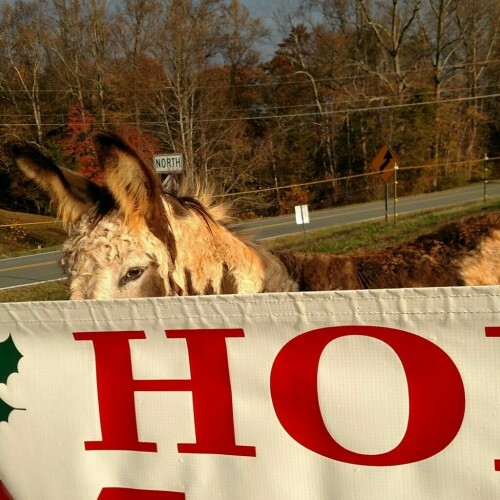 We've been trying to get out and enjoy some of the special things that the Holiday Season offers. 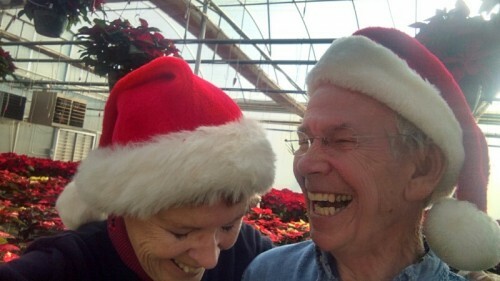 Last Friday we went to TubaChristmas and on Sunday we went to Mitchell's Nursery and Greenhouse for their amazing Poinsettia Open House. 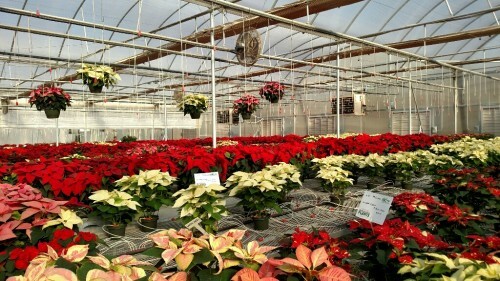 They grow 80 varieties of poinsettias and more than 10,000 plants. 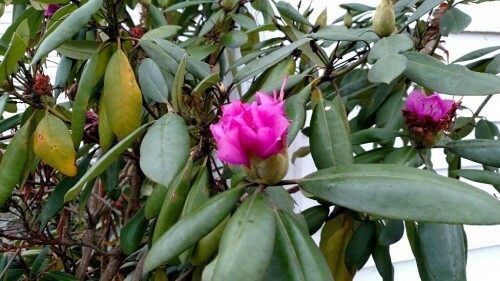 Each year, they host an open house where visitors can vote on their favorite cultivars. Mitchell's is one of 33 commercial growers in North America to participate in the trials and this information is provided to the breeders association. Even though the open house has passed, Mitchell's still has an outstanding selection of poinsettias for your home or office! 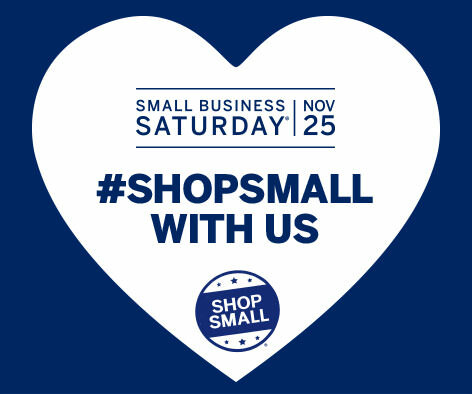 Shop Local -- Without Leaving Home! Speaking of well-stocked -- the shelves of our online store are filled with jams, garlic and ginger powder, gift boxes and more! 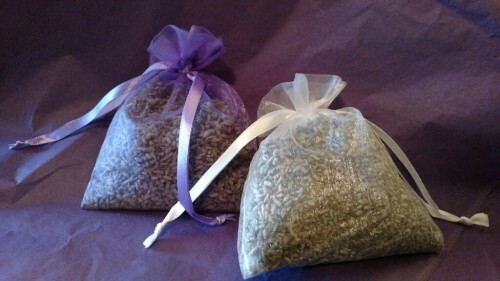 And new for this year, we just added our fragrant Lavender Sachets! So don't head out to the Big Boxes! We make it easy to shop local without leaving your house! Our hand-made, farm-grown items are perfect as a hostess gift, a teacher, or even for yourself! Looking for a custom option? 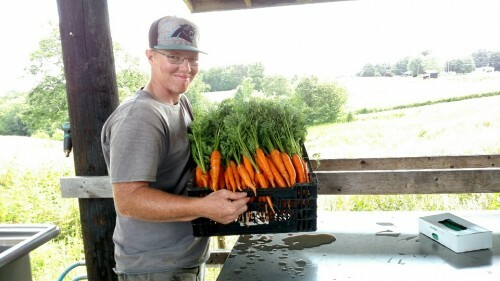 Give us a call (336-994-2517) or send us an email (farm@plumgrannyfarm.com) and we can put something together for you! We'll even take care of the hassle of shipping them! Check out our updated online store and see what we have to offer. Hopefully you got to see the amazing Supermoon on Sunday! Wow, what a sight! The cold night skies will have another special treat for us next week. The Geminid Meteor Shower began this past Monday but will peak next Wednesday night/Thursday morning. The great thing about this meteor shower is that is becomes visible just a couple hours after nightfall -- you don't have to wait until after midnight to see them. 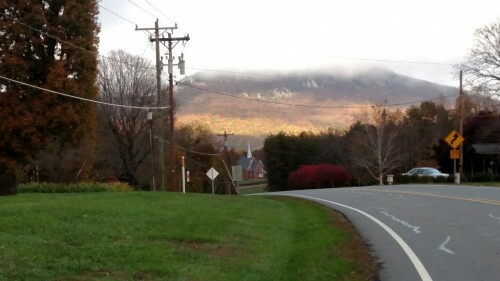 So bundle up and check out the heavenly view! P.S. It's STILL snowing! Glad we don't have to plant garlic today! 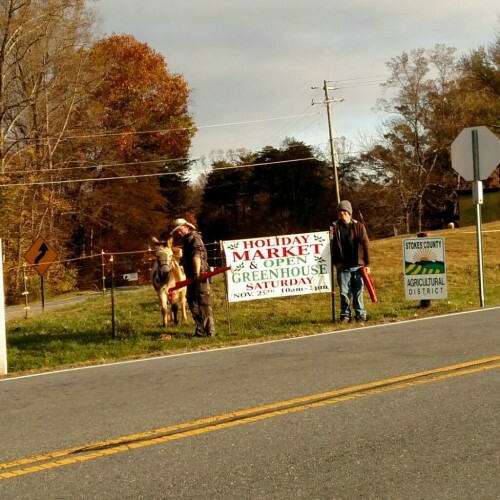 Plum Granny Farm Weekly Update for December 1, 2017 -- December Delights! Posted 12/2/2017 3:02pm by Cheryl. Once again the calendar has flipped and now we are on the last month of the year. Wow! It seems that we just started 2017 -- but as they say, time flies when you are having fun -- or at least when you are busy! And boy, have we been! We've been reclaiming the greenhouse and putting things back together after our terrific Small Business Saturday Holiday Market. Thanks so much to so many of you coming out to support small, local businesses! We had well over 200 people attend and we could not have asked for a more beautiful day. Check out some of the pictures taken by our friend Matt Blalock as well as this article in The Stokes News. 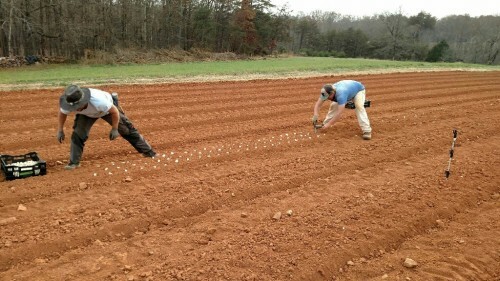 With our last market event of the year behind us, it is time to get the garlic planted! It's not just a matter of planting, it's the cracking, sorting, counting, planning, prepping the field, and then planting. And we jumped right on the task this week! 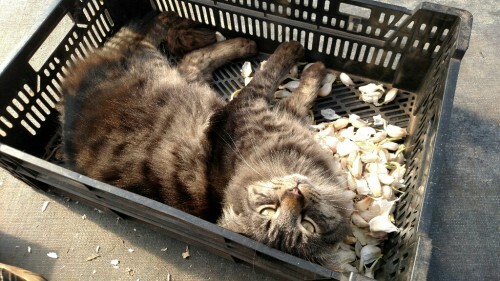 The weather has been great, so we will plant garlic while the sun shines (isn't that how the saying goes?!). ...and the beginning of another. Crack, crack, crack that garlic! 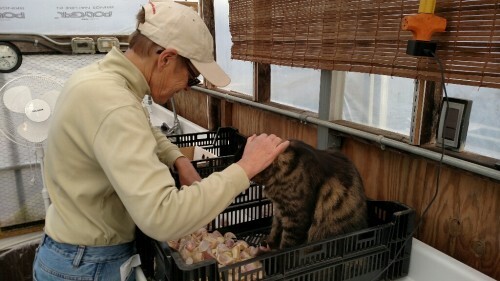 Have you ever tried counting garlic while petting a cat? It's NOT easy! If you're looking for gifts for the foodie on your list, something edible is always a great choice. Our jams, garlic and ginger powders and gift boxes are ready for giving! We'll even take care of the hassle of shipping them! Check out our updated online store and see what we have to offer. 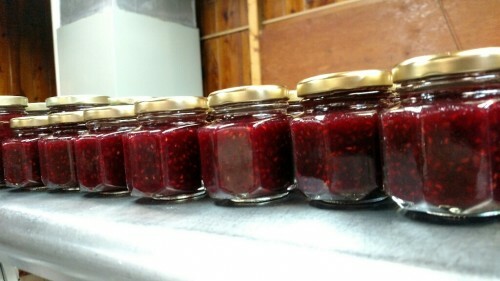 All of our jams are back in stock -- including our new Raspberry-Lavender! 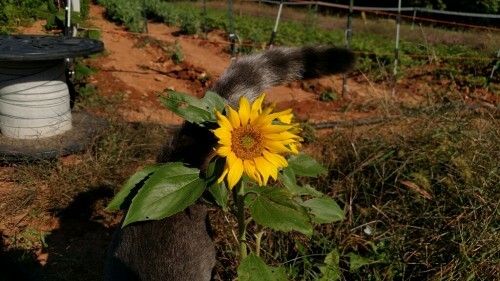 A gift from Plum Granny Farm is always in good taste! This weekend marks the December Full Moon -- the Full Cold Moon. It is also called the Long Nights Moon by some Native American tribes because it occurs near the winter solstice. This moon is also a Supermoon. It crests on the evening of Sunday, December 3 and reaches perigee -- the point in its orbit at which it is closest to Earth -- early morning Monday, December 4. When a Full Moon rises at perigee, the Moon appears larger and brighter than usual which is why it is called a Supermoon. Get out there and enjoy it! Plum Granny Farm Weekly Update for November 17, 2017 -- Cobblestone Farmers Market Finale! Posted 11/20/2017 9:27pm by Cheryl. 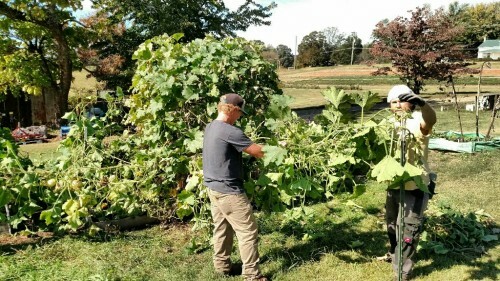 Last weekend's freeze hit pretty hard -- it's always difficult to say goodbye to all of the plants that we've been carefully tending over the summer and fall. But one clear lesson you learn as a farmer -- there are life cycles. 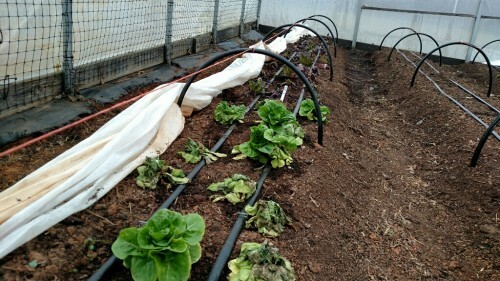 The Seasons dictate what we can do and grow (although we do cheat a bit with season extension and greenhouses). 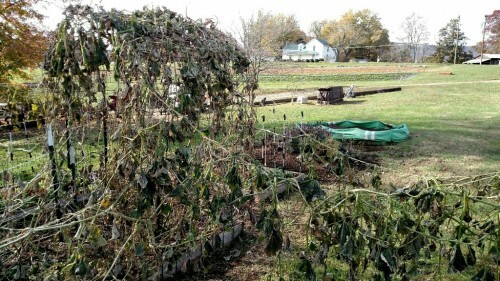 Before the freeze, we harvested all of the peppers, winter squash and tomatoes. 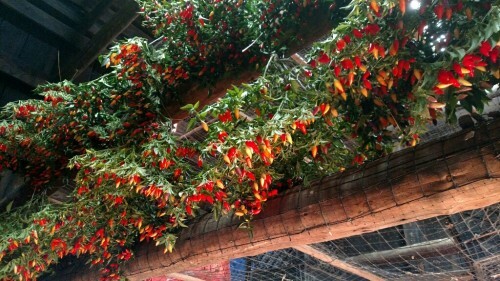 They are now tucked into the greenhouse to ripen or are hanging to dry. So all is not lost! 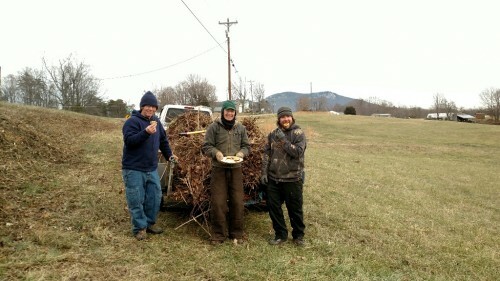 This week we have been cleaning up the dead plants -- the compost pile has a LOT to work on now! 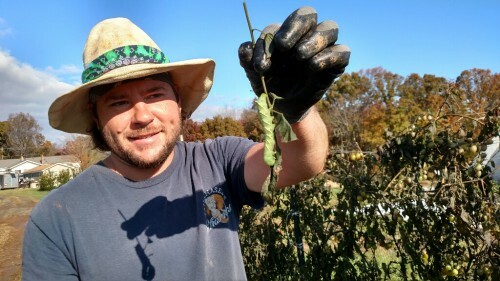 One of our more interesting finds was a hornworm in the tomatoes! And it was still alive! Speaking of cheating a bit with the extending the seasons....we now have our hoophouse (Raz House) finished and ready to plant! 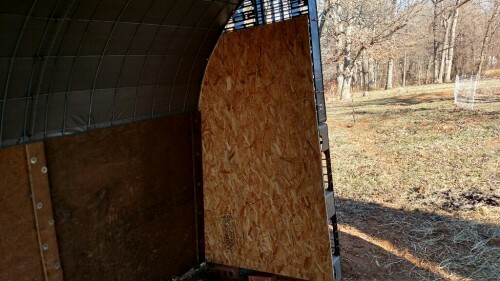 It is completely covered and we've added vents at the top that can be opened or closed as needed (instead of just cutting a hole in the plastic in the summer!). Chris tilled in the new leaves and formed some absolutely beautiful beds! We are going to have some mighty happy plants!! Don't forget to mark your calendar and set your clock for NEXT Saturday, November 25 from 10-3! 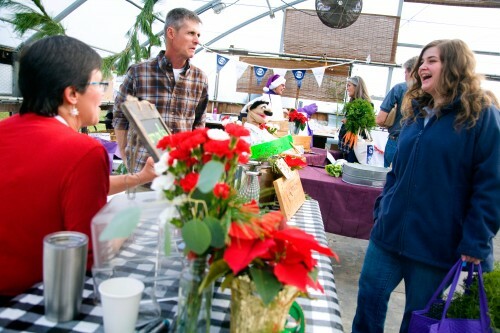 Gifts, fresh veggies, Holiday decorations and more will be found right in our greenhouse! You'll even be able to get a tasty, fresh lunch. Join us and our 9 vendors and our partners at Buffalo Creek Farm and Creamery and their 14 vendors! Pick up a flyer at market and stay tuned for more details! For profiles of the vendors that will be here, check out our event page on Facebook. Yes, that sad day is upon us. 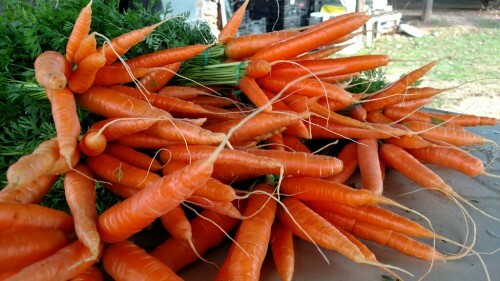 Saturday will be the last day of the Cobblestone Farmers Market in Old Salem! But it is going to be a great one! We'll be there tomorrow with lots of Certified Organic tastiness to keep your Thanksgiving tastebuds happy! Make sure you are well-stocked with GINGER! We have a new batch of Powdered Organic Ginger (it's NOT your typical grocery store stuff!). We also have FRESH BABY GINGER! Better make sure you have lots in the freezer for your Holiday cooking needs and warm tea in January! We are happy to provide you with care instructions and recipes. Did you say "More Carrots, please?!" We'll have bunches of them along with Kale, Swiss Chard, Lettuce, Pac Choi, FrisÃ©e, Radicchio, Kohlrabi and Freshly cut Herbs (Rosemary, Garlic Chives, Dill, Italian Parsley)! In the Garlic Department, we'll have Garlic Powder and Granules and maybe a few Garlic Sampler Bags. Think you'll have leftover turkey? Make a big ol' pot of Green Chile Stew! Grab a bag of our fire-roasted green chile and we'll give you a recipe to bring a little bit of New Mexico to your kitchen! All of our products are Certified Organic and are grown by us! If you would like us to hold an item for you, please let us know by 10:00 p.m. tonight. As we get closer to Thanksgiving, we want to let you know how thankful we are to you for your business, your encouragement, your cheerfulness and your friendship. 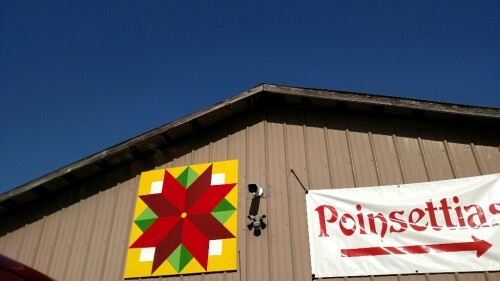 We could not do this thing we call Plum Granny Farm without you -- and we are most grateful. 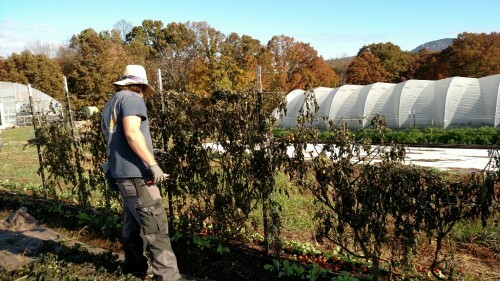 Plum Granny Farm Weekly Update November 10, 2017 -- Do The Pre-Freeze Hustle! Posted 11/12/2017 8:17am by Cheryl. 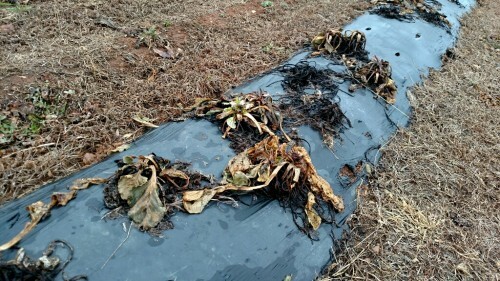 One of the problems of farming in NC is that we get a lulled into thinking that really cold weather and freezes will come...eventually. 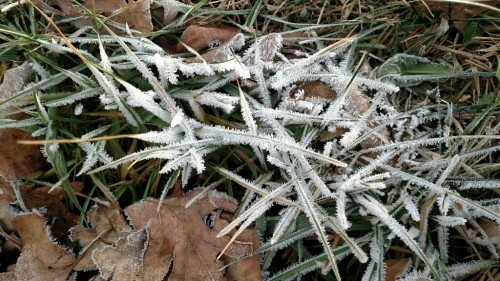 Our average frost date is October 15 but it seems like we haven't been anywhere near that date since we've been back. Farming here is a bit like our approach to life when we lived in New Mexico. There we could put off outside tasks because we always knew that the weather would be nice and wouldn't be raining. Car needs to be washed? We can do that tomorrow. 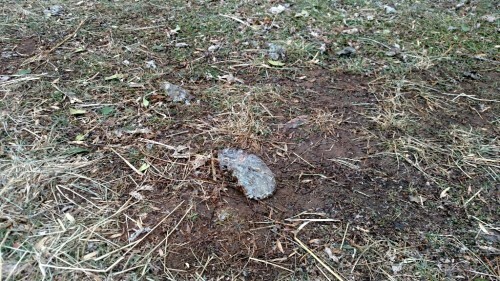 Leaves need to be raked? Manaña. Well, just like in New Mexico, the rain or freeze eventually comes. Better hustle! Chris at Well #1 all tucked in for the freeze. Despite the forecast for sub-freezing temps, the good news is there will be sunshine! This has been a very challenging week with clouds, fog and drizzle for days on end. Our personal solar batteries are drained! The clouds and rain made for some beautiful pictures with nicely saturated colors, but it sure has been bleak. 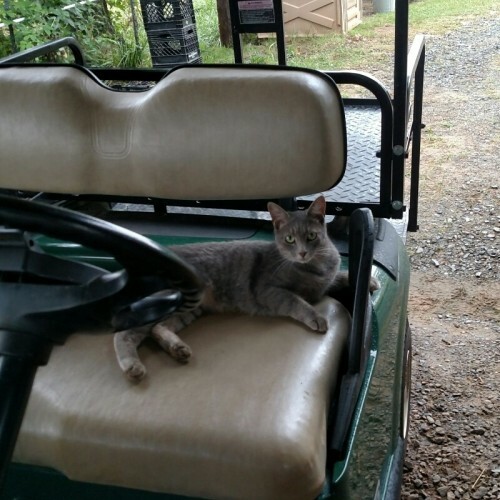 We are happy to report that our temporary feline boarder has found a home! 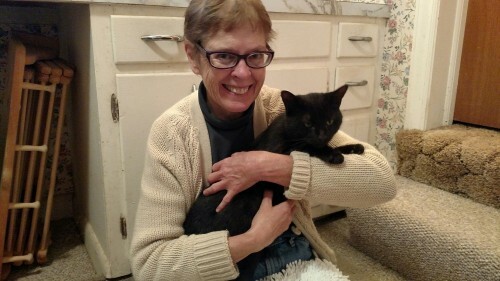 Our customer Karen and her daughter Katie Rose decided pretty soon after they read about our little black cat that they were interested in him. On Tuesday, we made the transition a reality. Karen reports that he "sang all the way home...then slept at the foot of Katie Rose's bed, motor running." 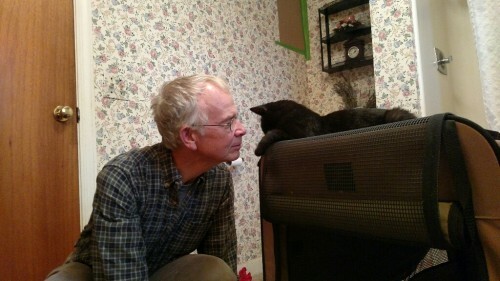 They are still getting used to one another (and the the other 4-footers in the family) but these transitions take time. 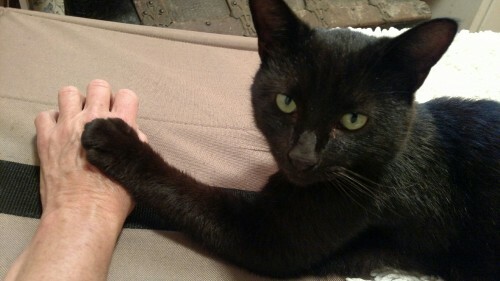 Fare thee well, our little panther -- we loved having you with us for a short while. 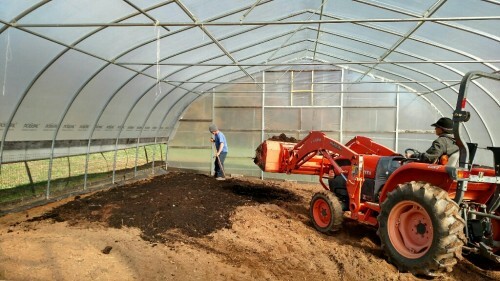 A key part of organic farming is building the soil and that's what we've been trying to do. 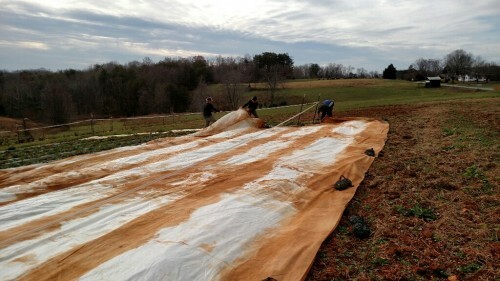 Increasing our use of cover crops over the winter is part of that. Planting crops like winter wheat, oats, peas and rye helps the soil build organic matter, inhibits weeds and reduces erosion over the winter. All good things for soil health. Here's a shot of the winter wheat in Bee Field starting to emerge. 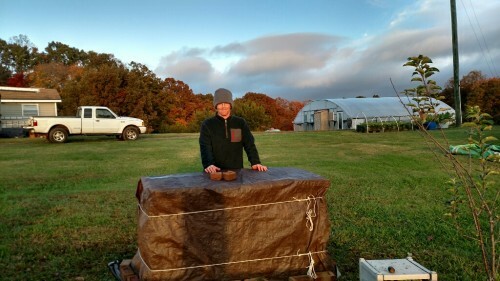 This year we trialed a small planting of peanuts in our Demo Garden. 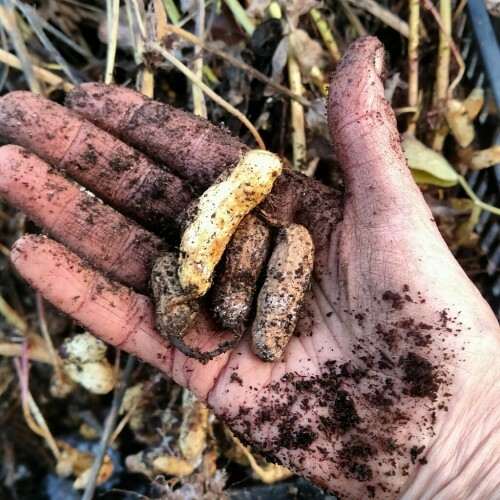 Back in June, we planted Carolina Black peanuts which are a heirloom variety that we got from Southern Exposure Seed Exchange. 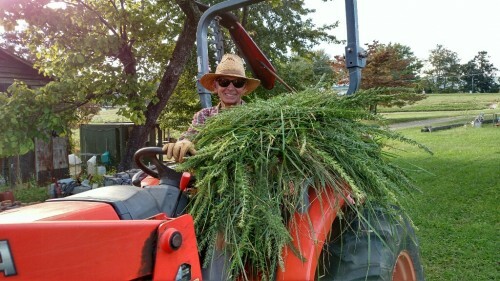 Today we harvested the crop -- very exciting! They need to cure for about 2 weeks and then we can sample! We are looking forward to planting a lot more peanuts for 2018. Holiday Market Countdown! Just 2 Weeks Away! Saturday, November 25 (10-3) is the B-I-G day! 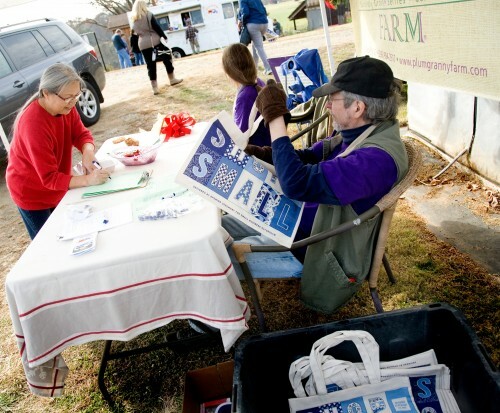 It's our 4th Annual Small Business Saturday Holiday Market here at the farm! Find everything from Holiday decorations to that perfect gift to delicious items for a festive meal. And you can shop in the stress-free environment of our greenhouse (sure beats the mall!) all while supporting local farms and vendors. Join us and our 9 vendors and our partners at Buffalo Creek Farm and Creamery and their 14 vendors! Pick up a flyer at market and stay tuned for more details! For profiles of the vendors that will be here, check out our event page on Facebook. What's Under the Purple and White Tents? 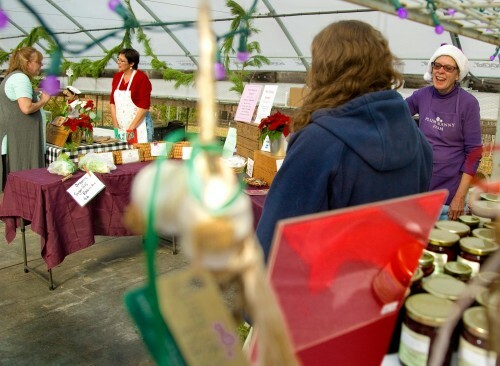 Only TWO more days to shop at Cobblestone Farmers Market this season! 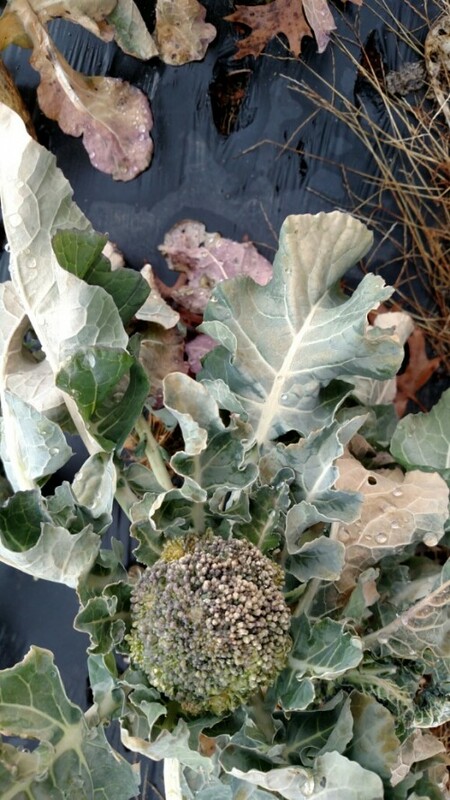 Yes, it's going to be a cold day but bundle up and head out for some GREAT organic produce! 'Tis the season for all things GINGER! We have our first of the season Powdered Organic Ginger! It will make your Holiday cakes and cookies sing with a great ginger flavor (it's NOT your typical grocery store stuff!). We also have FRESH BABY GINGER! Better make sure you have lots in the freezer for your Holiday cooking needs and warm tea in January! We are happy to provide you with care instructions and recipes. Oh, and those Carrots! We'll have bunches of them along with Kale, Swiss Chard, Daikon Radishes, Lettuce, Pac Choi, Frisée, Freshly cut Herbs (Dill, Italian Parsley) and maybe some Peppers and Heirloom Eggplant! In the Garlic Department, we'll have Garlic Powder and Granules, Garlic Sampler Bags, Seed Garlic and a limited amount of culinary garlic (supplies are running VERY low!). As the weather gets colder, it's time to make a big ol' pot of Green Chile Stew! Grab a bag of our fire-roasted green chile and we'll give you a recipe to bring a little bit of New Mexico to your kitchen! That's it for this week! Join us as we pause to salute our Veterans on Saturday. We are deeply grateful to so many Americans who have served our country -- and for many who made the ultimate sacrifice. For 98 years, Americans have remembered those who served our country in uniform on 11 November – first as Armistice Day, and then, since 1954 as Veterans Day. Take a moment, remember and thank a Vet today. 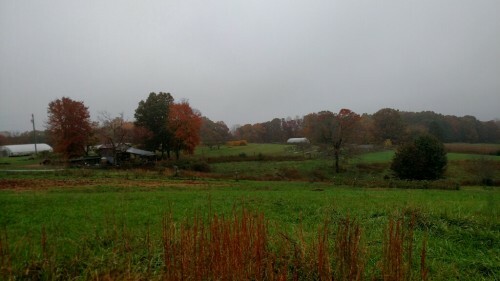 Plum Granny Farm Weekly Update October 13, 2017 -- Has Anybody Seen Fall? Posted 10/15/2017 3:43pm by Cheryl. Are you as confused as we are? Is it Fall? Is it Summer? Is it both? The correct answer seems to be choice #3 -- it does seem to be both! In the past week, we have had temperatures ranging from the 40s to almost 90! And based on the humidity, I'd swear it was July! Hopefully we can settle on the correct season (Hello, Fall?!) soon. It will be good to get off of the seesaw! This week we have been working on some of our fruit crops. On Monday, Chris and Jonny gathered about 100 blackberry plants (in the rain) that had rooted in the aisles. These plants will be potted up and nursed through the winter and will be available for sale next spring. See, we are already planning for next year's Plant Sale! 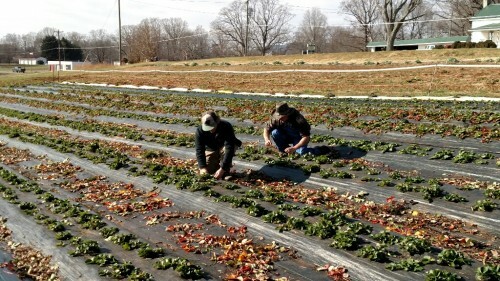 We have also been working to get the strawberry field ready. 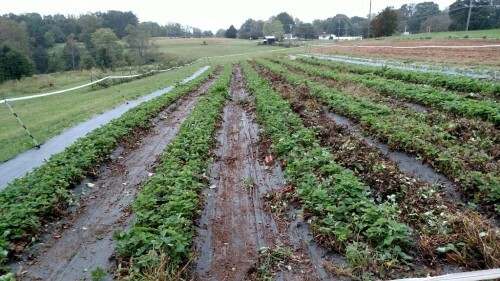 The newly planted strawberries got a nice drink of fish emulsion and are busy growing strong roots. The plants that we are carrying over to next year need to be weeded and pruned plus the aisles need to be cleared. 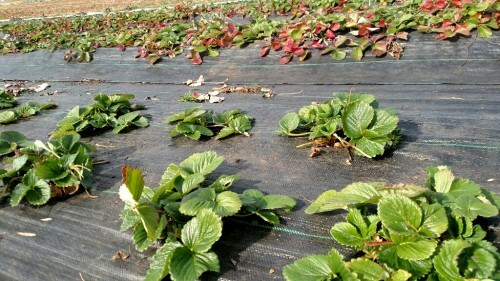 Strawberries really spread out and they had completely covered the field. Chris and Jonny did a great job yesterday of clearing the aisles and beginning the weeding process -- and they had a full truck to prove it! 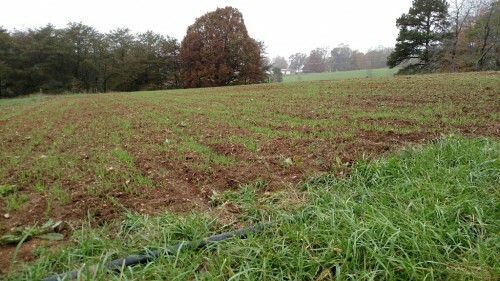 Here's what the the field looked like in August when we were gathering tips for transplanting. 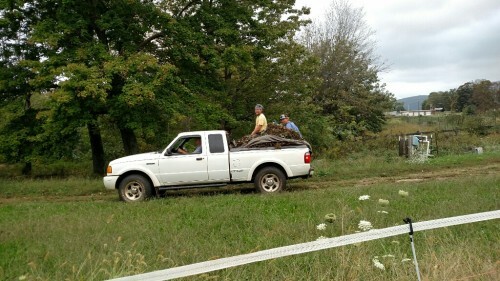 There goes a truckload of strawberry trimmings to the compost pile! Great job, Chris and Jonny! BB & Tony Moving Day! 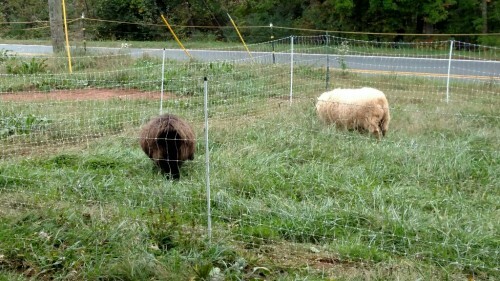 As we try to do every few months, we moved BB and Tony to new pasture yesterday. We rotate their paddocks to make sure they have grass and to reduce the opportunity for disease. Ideally we would have 3 areas to rotate them through -- but we don't have that set up yet. 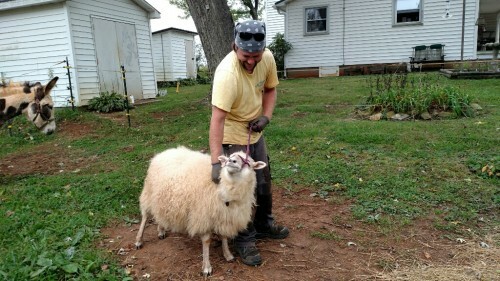 And while we were at it, it was time to give Tony a hoof trim -- not his favorite thing to do on a Thursday afternoon! But he guesses the new tasty grass is worth it! Tomorrow at Cobblestone Farmers Market, we are still THINKING PINK! We'll have lots of tasty and versatile FRESH BABY GINGER! 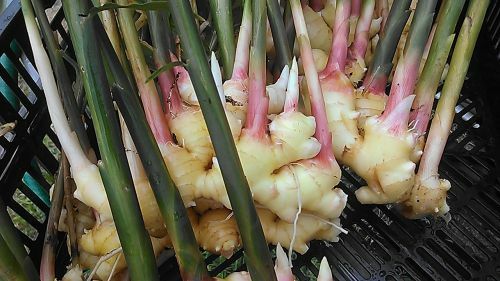 Baby ginger can be used for lots of different dishes -- try it with pork or to brighten up a chicken stew. We'll be happy to provide you with a handout that has care instructions as well as a few recipes. There will be more beans again this week! From the delicious purple-striped Rattlesnake Pole Beans to the hearty Romano-style Beans (absolutely delicious roasted! ), you'll find lots of bean-y goodness on our tables. 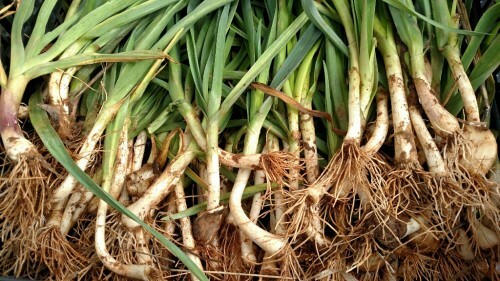 New this week is Baby Green Garlic! We had some cloves that remained in the field after harvest and now have a nice crop of baby garlic -- like the spring garlic we have in April. Tender and tasty -- come check it out! Also in the Garlic Department, you'll find Inchelium Red, Music, Georgian Crystal, Chesnok, Lorz Italian and Elephant, Garlic Sampler Bags, Garlic Braids plus a bit of the Cream of the Crop Seed Garlic. We'll have more of our Heritage Muscadine and Scuppernong Grapes on the table. 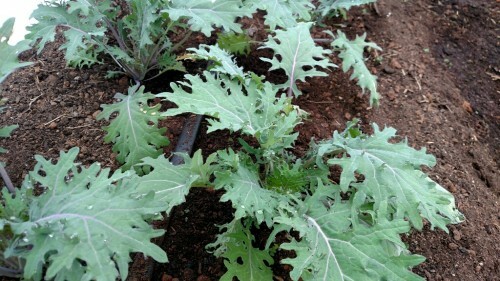 You'll also find Red and Green Butter Lettuce, Kale, Swiss Chard, a little bit of Okra, Daikon Radishes, Tomato Fruit Boxes, a few Heirloom Tomatoes, Heirloom Eggplant, freshly cut Herbs (Dill, Italian Parsley, Rosemary) and Sweet Charlie Strawberry Plants! You'll also find fresh peppers of all types: Shishitos, Poblano Peppers, New Mexico-type Green Chile, Ashe County Sweet Pimentos, Purple Beauty Peppers, Jupiter Sweet Red Peppers, the sweet habenero Aji Dulce and candy-sweet Picnic Peppers. And even though the roaster has exited for the season, we'll have freshly roasted green chile (Joe Parker, Big Jim and Poblano) in our freezer. That's it for this week! 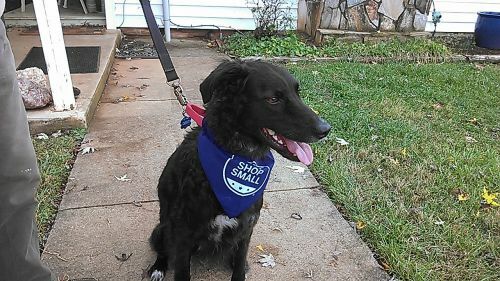 If you are coming to Cobblestone Farmers Market tomorrow (or if you need another incentive to come to Old Salem! ), check out Harvest Day! It's a fun-filled day of activities involving favorite fall foods from the harvest! Activities are located in the historic district from 9:30-4:30. Celebrate the fall harvest with hands-on activities, historic demonstrations, vendors and more! We'll be there checking out the apple vendors! Plum Granny Farm Weekly Update October 6, 2017 -- Oh, October! Posted 10/8/2017 3:22pm by Cheryl. 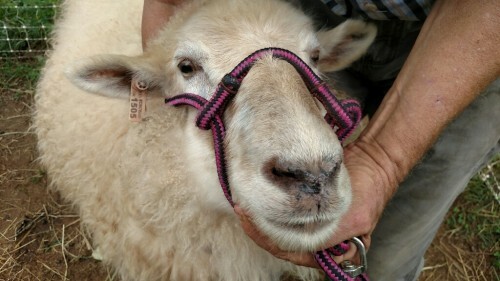 Hello Farm Friends! Happy Friday! Welcome October! 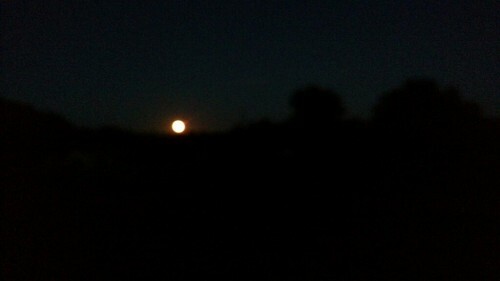 Watching the Full Moon rise last night was amazing. 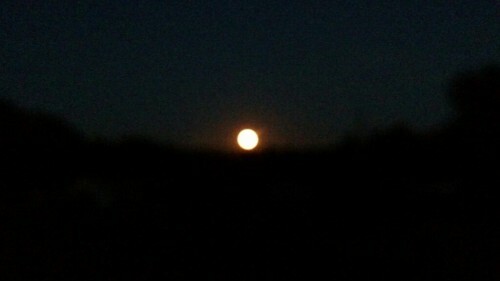 When I first saw it peeking over the treeline, it was deep orange. It reminded me of The Great Pumpkin, of Peanuts lore. This Full Moon is the Harvest Moon, which is the first full moon after the Autumnal Equinox. It's called the Harvest Moon because its bright light allowed farmers to harvest crops a bit longer during the day. The moon rises at sunset and sets around sunrise, so this is the only night in the month when the Moon is in the sky all night long. We farmers need our extra light this time of year! 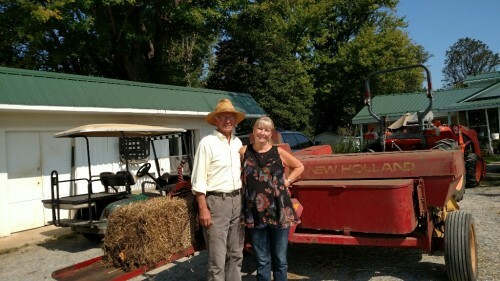 Your farmers did sneak away for a while on Monday to catch a bit of the Dixie Classic Fair. We are big fair fans and really miss the New Mexico State Fair (if you are ever in Albuquerque in early September, put this on your Must See List). 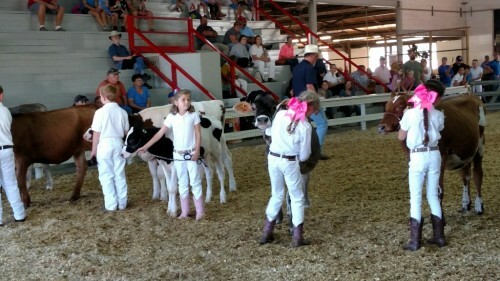 It was great seeing the kids show off their prize cows at the Junior Dairy Cow Show. It was also great to see our friends Houck and K.B. Medford there. 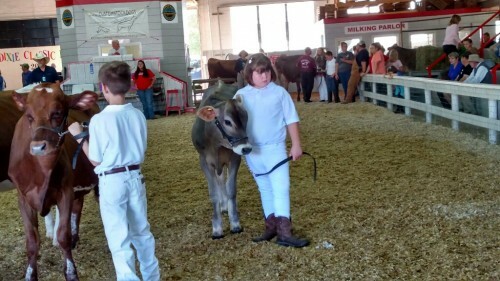 They were documenting the Sifford Family's experiences in the livestock competitions during the fair. Check out some of their posts on Instagram -- @houck_medford or his website. You might recognize some folks there! 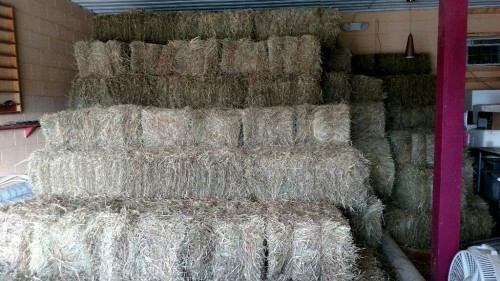 The hay has all been baled and is stored away! Hooray! 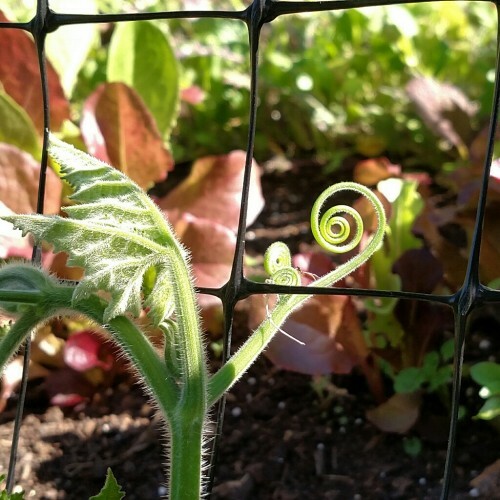 And the Seminole Squash vines that have been steadily covering the lawn in the Demo Garden has now been safely corralled. Bunches of little winter squashes on this massive vine! We've been calling this the Hobbit House -- I think it is now the Hobbit House and Gardens! 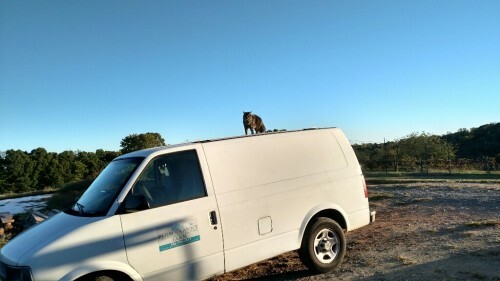 And Detroit can always be counted on to find the highest perch possible to scout for any invading tuna. Meanwhile, RingBob prefers the camouflaged approach. We are sorry but we had to cancel this year's Growing Great Garlic at Home workshop due to the high likelihood of storms and rain on Sunday. 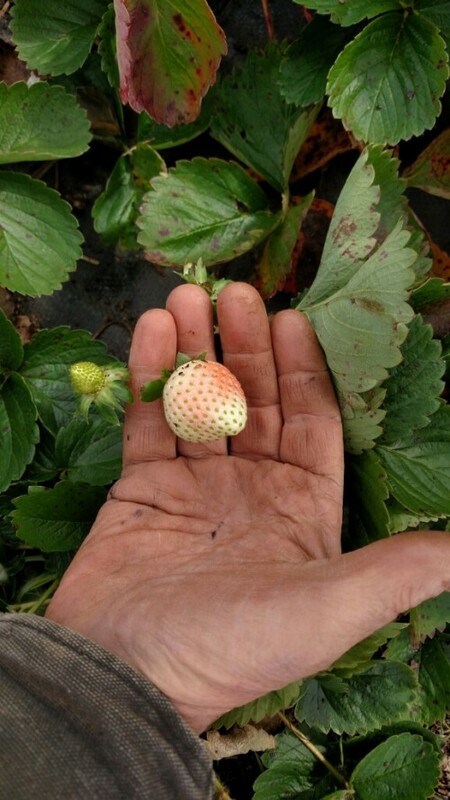 You'll get a chance next October to learn more about growing this amazing crop! Tomorrow at Cobblestone Farmers Market -- THINK PINK! 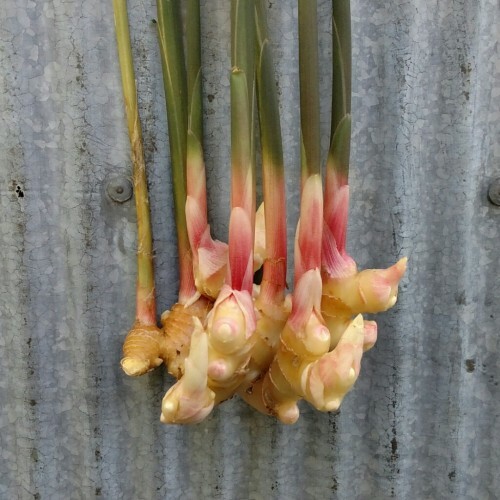 We'll have bunches of FRESH BABY GINGER! Baby Ginger is an amazing seasonal treat to be savored! We'll have recipes and care instructions. There will be more beans again this week! From the delicious purple-striped Dragon Tongue Flat Pod Beans (absolutely delicious roasted!) to the delicate Tavera haricot verts, you'll find lots of bean-y goodness on our tables. We'll also have more of our Heritage Muscadine and Scuppernong Grapes along with Frissé, a little bit of Okra, Daikon Radishes, Heirloom Eggplant, Snow Peas, freshly cut Herbs (Dill, Italian Parsley, Rosemary) and maybe some Tomatoes. 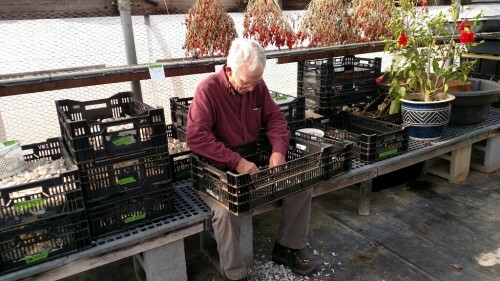 In the Garlic Department, you'll find Inchelium Red, Music, Georgian Crystal, Chesnok, Lorz Italian and Elephant plus the Cream of the Crop Seed Garlic (Chesnok, Lahontan and Elephant). 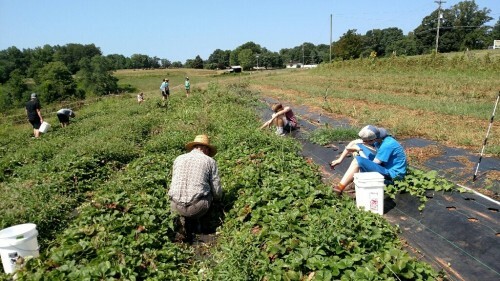 Don't forget -- if you want to grow some strawberries at home, we will have 4-packs of Sweet Charlie Strawberry Plants available at market tomorrow. 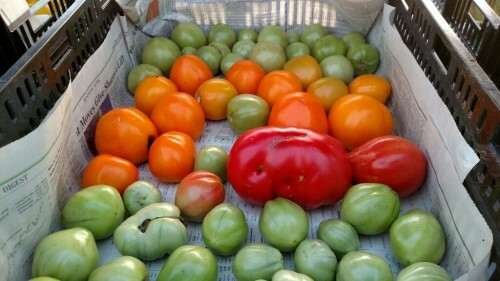 These are from tips that we collected in August and have been growing in the greenhouse. Enjoy these gorgeous October days. And keep your eyes open for little moments of beauty and wonder. They can help us get through these challenging times. Posted 10/2/2017 8:32am by Cheryl. 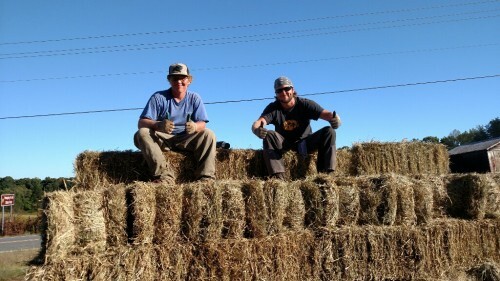 Hay Daze are upon us! 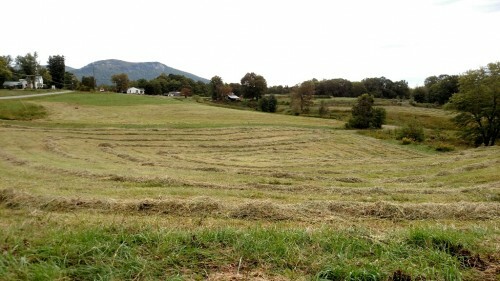 We've been blessed with a stretch of good weather for making our fall crop of hay. Hot and dry conditions have helped us cut, rake and bale in record time -- and without the stress of wondering if we would be hit with rains. Since we lost a lot of our spring hay due to rain, it's been nice to have these conditions. Hooray! Our snap beans have started producing in full force! 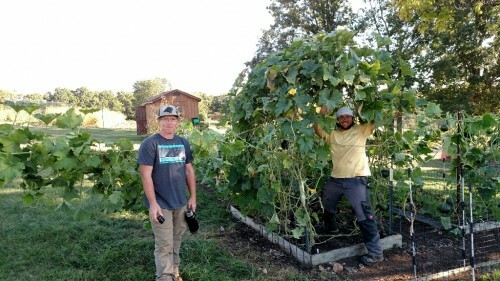 We harvested over 35 pounds on Monday -- our first day of picking! 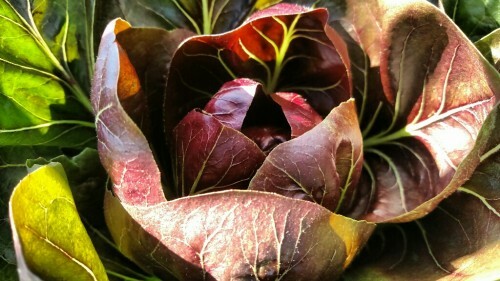 And check out this beautiful Radicchio! 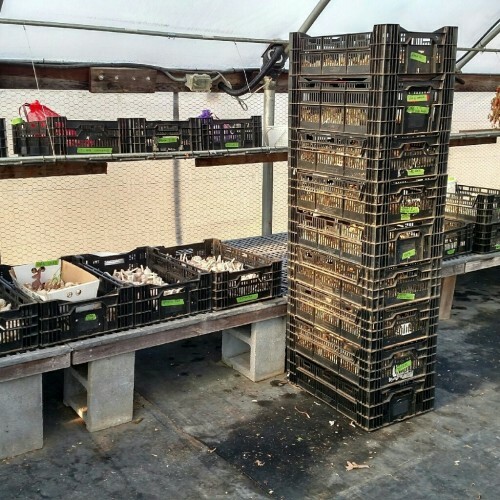 Last Chance to Register for Garlic Workshop! 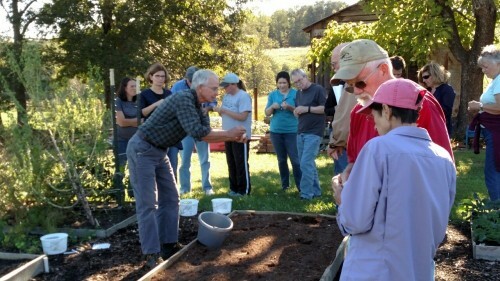 It's your last chance to register for our Growing Great Garlic at Home workshop! If you have always wanted to grow garlic but need some advice to get going or want to improve your skills, this is just the ticket! 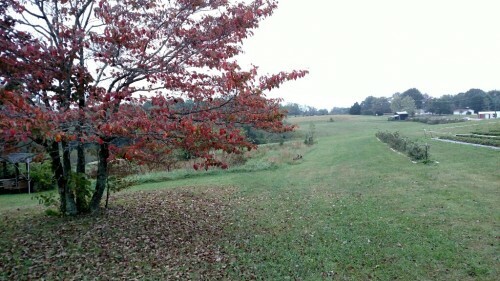 It will be held here at the farm next Sunday (October 8) from 2-5! Get your registration in TODAY! 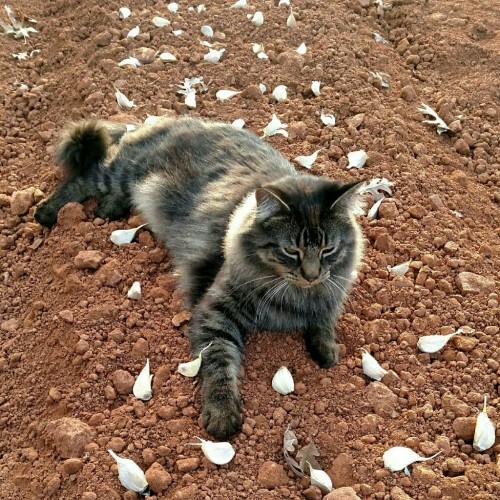 The class fee is $32 and includes a 1/2 pound bag of seed garlic. For more information and a registration form, check out our website. 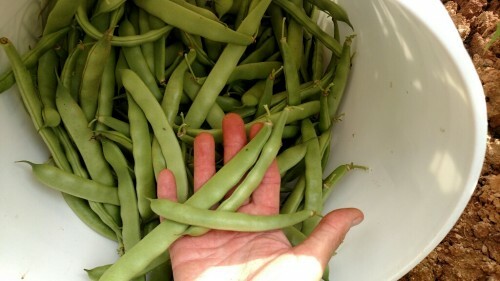 Tomorrow at Cobblestone Farmers Market we'll have the first of our GREEN BEANS (Romano, Pole, Round and a few haricot verts). Plus we'll have the first offering of FRESH BABY GINGER! Even though the roaster has exited for the season, we'll have freshly roasted green chile (Joe Parker, Big Jim and Poblano). 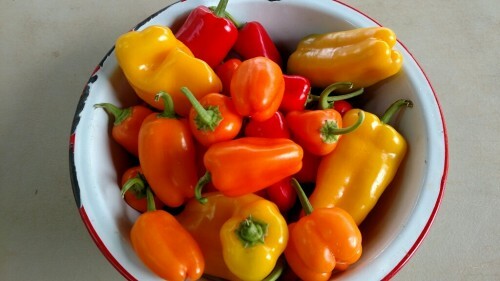 You'll also find fresh peppers of all types: Shishitos, Poblano Peppers, New Mexico-type Green Chile, Ashe County Sweet Pimentos, Purple Beauty Peppers, Jupiter Sweet Red Peppers, the sweet habenero Aji Dulce and candy-sweet Picnic Peppers. We'll have more of our Heritage Muscadine and Scuppernong Grapes on the table. You'll also find Frissé, Sunflower Shoots, a little bit of Okra, Daikon Radishes, Tomato Fruit Boxes, a few Slicing Heirloom Tomatoes, Heirloom Eggplant, freshly cut Herbs (Dill, Italian Parsley, Rosemary) and Sweet Charlie Strawberry Plants! 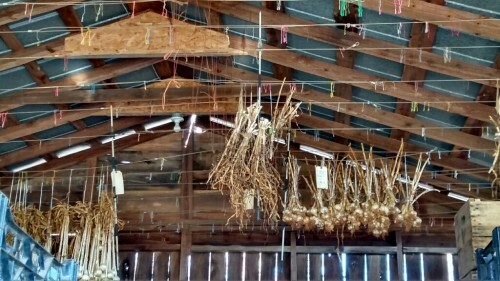 In the Garlic Department, you'll find Inchelium Red, Music, Georgian Crystal, Chesnok, Lorz Italian and Elephant plus the Cream of the Crop Seed Garlic (Chesnok, Lahontan and Elephant). In closing -- and in keeping with the "Hay" theme, we wanted to share a poem from our dear friend and neighbor, Jenny Bates. 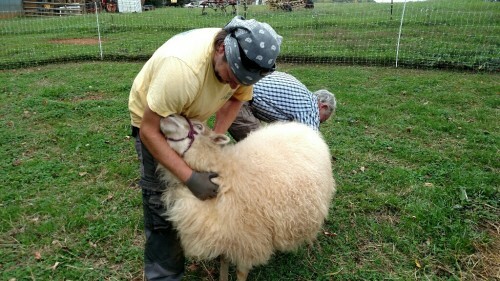 Jenny, and her husband Bob, are great friends of the farm and are frequent visitors - especially to see Brix. Jenny is a published author -- her most recent work is found in Flying South, a publication of Winston-Salem Writers. Thanks so much for sharing this, Jenny!